1. Drag a monster silhouette up from the primordial goo at the bottom of the screen. 2. Decorate the monster using your finger to draw in one of 5 colors. 3. Tap on the checkmark to tell the game you’re done drawing on the monster and your monster will grow eyes, horns and a mouth (although if you don’t like those, you can pluck them off and different features will grow in their place). 5. After the monster has eaten, its teeth look quite dirty, so it’s time to brush! 6. Pull more accessories up from the goo (a hat! a bandaid! a lightning bolt! the options are vast.) and finish designing your monster. 7. Take a picture (or don’t) and tap on the checkmark when you’re ready to meet a new monster. I love this app for the open-ended (but not overwhelmingly option-heavy) art play and for the silliness factor that makes users of all ages giggle. The storytime kids loved telling me how to design the monster (What color should we choose next? Should we draw spots? Stripes? Squiggles? Where should we put this mustache? Do you like these eyeballs?) and they loved watching it eat crazy food and brushing its teeth. One mom told me that her daughter loves to use the app and then go into the bathroom and brush her own teeth. Every time. Hooray for the sneaky health lesson! For a limited time, it’s free in the app store (all decked out for Halloween! ), so grab it while you can. Read about the other monster apps I used in my storytime here. 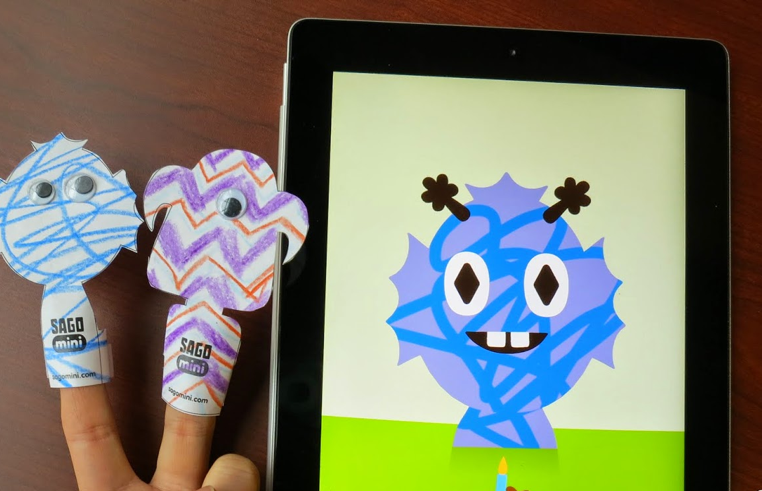 Make your own Sago Mini Monster finger puppets by downloading the pdf’s here (then printing them at 25% and adding a strip of paper at the bottom to wrap around your finger). Posted on October 25, 2014, in Apple, Apps, Libraries, Story Time. Bookmark the permalink. 1 Comment.